Affordable Beachfront Hotel, Perfect for Relaxation & Fun Activities. 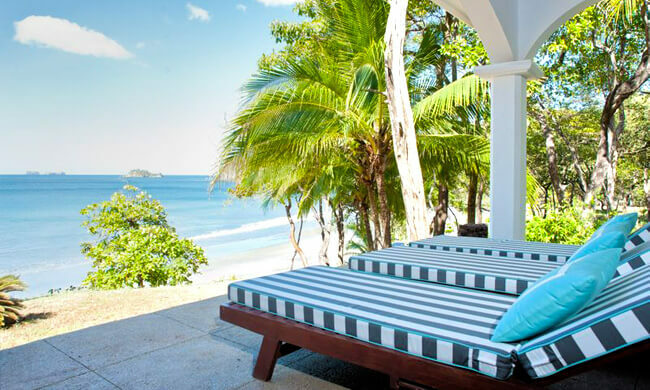 Set along a secluded stretch of Costa Rica’s North Pacific coast, Sugar Beach Hotel is an affordable boutique property just steps from the sand. Hotel Sugar Beach is a lovely option for families, couples, and groups looking to spend quality time doing fun activities and relaxing at the beachfront hotel in Costa Rica. There are 27 guestrooms along 22 acres of secluded beachfront land with plenty of wildlife and activities. Guest rooms are comfortable with modern accommodations and décor that is true to the Guanacaste region. Room amenities include A/C, Satellite TV, DVD, safe, mini-fridge, and coffee-maker. All units come with their own furnished patio or balcony. Complimentary WiFi is available in the lobby and restaurant. The open-air restaurant has lovely views of the ocean and serves breakfast, lunch, and dinner. Menu offerings range from traditional Costa Rican dishes to international delights, using fresh local ingredients and fresh-caught seafood. Dietary considerations and food allergies can be accommodated with notice. Guests can enjoy a swimming pool, rent boogie boards and snorkeling masks, and book activities like horseback riding, zip lining, surf lessons, scuba diving and more at the front desk. A la carte breakfast is included daily.